Over the recent weeks, we've been in a study detailing the great Grace of Almighty God. We've seen how greater Grace is than any failures and shortcomings. We examined how greater Grace is than any performance-based concepts of men. In our last study, we began looking at how greatly we've been forgiven of our sins. One of the greatest objections to the message of Radical Grace is the idea that our future sins have already been forgiven. You would think that this notion of future forgiveness is some new idea brought forth by Pastor Joseph Prince. Yet, if you would visit some mainline denominational theological studies you'd see that many Christians hold to this belief. Some Baptists groups, for example, hold to this view. My only point is that this concept isn't some fringe, out of touch, unorthodox teaching. Before we proceed, we must acknowledge men can bloviate about any theological topic they want. At the end, all that matters is what does the Scripture actually say? Let's allow the Word of God to establish the truth and then we can expound on its implications. What I've posted is the Scriptural proof of just how many sins He has forgiven us. He forgave us all our sins. Not just some, not just past, but all of our sins. We are forgiven past and present and future. These passages point that we aren't forgiven in some kind of installment plan. It reveals we should forgive others who wrong us because we have already been forgiven in Christ. We are forgiven all our sins past tense. What does this mean? It means we were forgiven of all our sins at a particular point in time. When do you think this event took place? 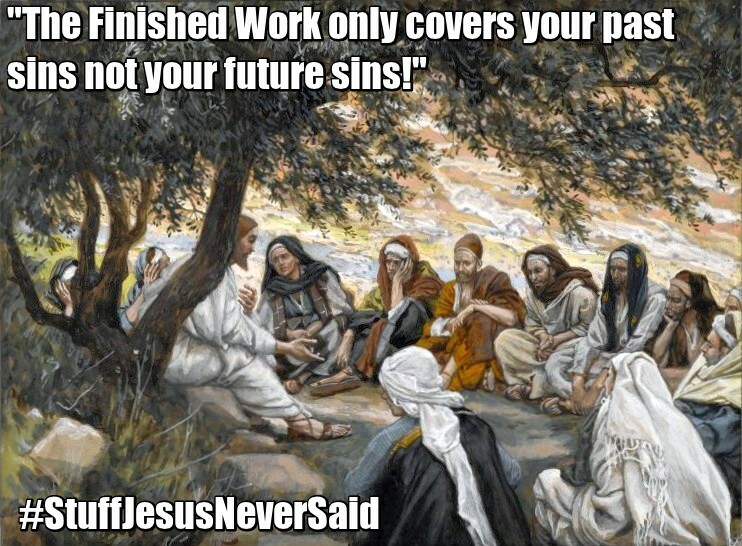 It is plain and clear that He forgave us of all our sins in the Finished Work. This is the good news of Grace. We are forgiven once for all time in Christ. Now where the controversy begins is what does this truth mean for the believer today? How is this truth applied to our Christian walk? The religious minded resist this truth. They can only accept that God paid for our past sins and not our future sins. Well, when Jesus died how many sins had we committed? None! We weren't even alive yet. 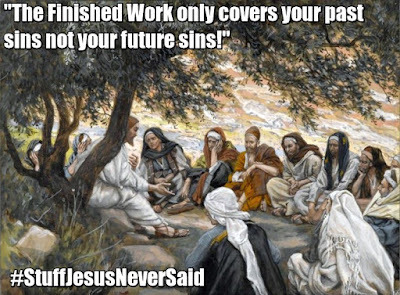 So all of our sins He paid for were future tense. This is where we can see just how much Grace we flow in when we see sin in our life or others. Obviously, no one in their right spiritual mind is in favor of sin. But what happens when we sin if we have already been forgiven of it? Let's see the progression of sin if you will that we normally see in Christian circles. So far no issue, it is normal when we sin or blow it or miss it to feel guilt, the issue is what do we do with that guilt? Now let's see how traditionally this progresses. 3. Because we have sinned we are unclean again and need to get right with God again. 4. Because we have sinned we are subject to some form of punishment or retribution for our wicked deeds. 5. Because of our sin, we are out of fellowship with God. 6. We need to come back to God in repentance, meaning we must turn around and cease this action or we really haven't truly repented. 7. We must confess this sin to God in order to receive forgiveness and be placed back in right standing with God. For those adhering to this traditional checklist, it is almost blasphemous to hear that our future sins have already been forgiven. This checklist is thrown aside when we realize just how forgiven we are. In the next few posts, I will deal with the concepts of confession of sins to be forgiven, true repentance and answer the question are we out of fellowship when we sin. For now, let's see the full implications of our complete forgiveness in Christ. When we know we have been forgiven once for all time we can fully rest in Christ's Finished Work. When we sin, we can take that guilt and see that Jesus already bore our sins and the shame and guilt that accompany it. We then can walk fear and shame and condemnation free. Instead of confessing our failures we can confess the Finished Work and our perfect right standing before God. When we focus on the Finished Work, we can see that the sin isn't who we are and that Christ has so much better for us. When we blow it, sometimes guilt suggests to our mind that we deserve punishment. We deserve a bad day or difficult circumstances. In fact, religious minded ones will say things like God won't answer your prayers or pour His favor out upon you. Inadvertently, they have created a concept where we also pay for the sins that Jesus bore. We must reject this notion. In the Finished Work, He bore the full punishment for all our sins, and we have total forgiveness. Rest in the complete forgiveness Christ gives. We aren't being punished for our transgressions. We can't pay for them anyway. We receive goodness, prayers answered and an outpouring of favor because of Jesus' faithfulness and not our own. Because of the complete forgiveness, we now have in Him, even when we sin we are still in right standing before God. His righteousness He bestowed upon us is an irrevocable righteousness. You no longer need fret that you are unrighteous when you blow it. You needn't feel like you have to crawl back to Him and grovel at His feet to be accepted again. You are completely forgiven and in right standing. God is pleased with Jesus once for all sacrifice for sins. He isn't looking for your groveling to perfect it. Now for those still objecting to our future sins being forgiven, then I say you are rejecting the entire premise of the New Covenant. If our future sins aren't guaranteed forgiven, how then can God say I will never again remember our sins and lawless deeds? The sin issue is settled in the sense that God has paid the full price. He is the final sacrifice. We now only have a reception problem. People need to receive the forgiveness of their sins and walk in freedom. In summation, Christ bore the sins of all mankind. He presents a free gift of total forgiveness and all we need do is simply receive it. When we freely receive this wonderful gift of Grace, we have received the complete and total forgiveness of all our sins. When we realize just how forgiven we are, we will bear much fruit. Remember Jesus words, to whom much is forgiven the same loveth much. We have been forgiven much, don't take the amazing out of Grace. We are forgiven completely, past and present and yes future. Wow thanks so much. So glad it blessed you. Share with your friends. Let's get the good news. the sins of our whole lives, or do we receive forgiveness as we sin?